Behind the success of the Metropolitan Naga Water District (MNWD) are the people who consistently delivers exceptional public service. The District has championed water-related initiatives because there are employees who get the job done with integrity and professionalism. Just recently, one of our employees was recognized for his exceptional service honoring the entire community of the MNWD. His name is Enrique Imperial Alvarez. Enrique or “Ricky” began his journey with MNWD as a Customer Service Assistant-A way back in 1999. His experience in the water district started with servicing households as a meter reader to water payment collector. At present, he is holding the position of Corporate Account Analyst under the Finance Department. He is a graduate of the University of Nueva Caceres (UNC) with a degree in Bachelor of Science in Business Administration Major in Marketing, happily married to Ma. Lourdes, and a proud father to Eric Michael. In his spare time, Ricky enjoys playing tennis and dart as well as biking. In fact, he represented MNWD in the previous BIWADA Sportsfest and hailed as the champion both in tennis and dart events. Turning 2-decade strong this year, maintaining the integrity and commitment to his oath as a public servant has always been Ricky’s guiding principle. Last June 11, 2018, Ricky was applauded by his colleagues and friends in the industry for the commendation given by the MNWD. His utter display of honesty while on duty was truly remarkable. In a world where most people are tempted to do otherwise, Ricky returned the excess payment made by one of our customers who was very grateful for his honesty. CERTIFICATE OF COMMENDATION. 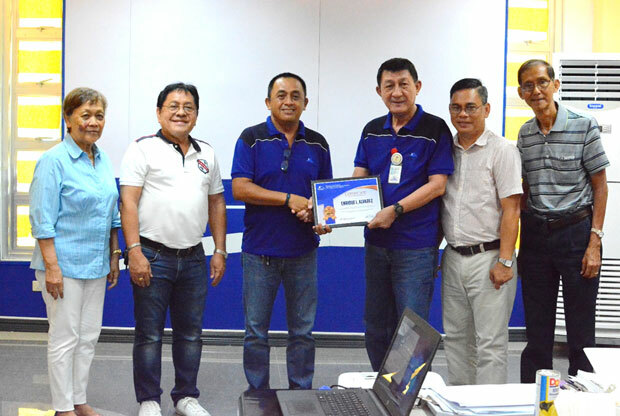 Enrique I. Alvarez (3rd from left) receiving the Certificate of Commendation from Jeremias P. Aban Jr., DMA – Management Supervisor for Operations (3rd from right) together with the Board of Directors (left to right) Monina Lily A. Claveria, Chairman Jorge T. Palma, Agileo Michael R. Pauig, and Adolfo L. Olivan.